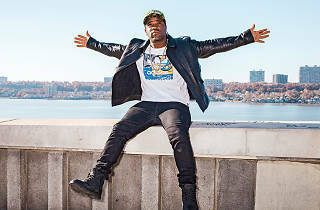 A$AP Ferg's sophomore LP, Always Strive and Prosper, came out earlier this year, but lately the Harlem rapper has been spending most of his time lending his vocal talents to other folks' songs. From the A$AP Mob cut "Yamborghini High" to the "g mix" of Usher's “No Limit,” Ferg's shouty proclamations and sung melodies have popped up in a number of guest spots. He'll be at another unexpected location later this week—at the Samsung 837 store (837 Washington St) where he'll play a free show on Thursday, August 25th. The gig starts at 9pm, though since it's first come, first served, you'll want to arrive early to claim a spot. To R.S.V.P., visit Samsung 837. Andrew is the Music editor at Time Out New York. Catch him at your local music venue, taqueria or cineplex. Follow him on Twitter at @andrewfrisicano.